Chennai: The Indian Institute of Technology Madras (IIT-M) today (12th April 2017) announced the launch of the ‘Deepak Parekh Institute Chair’. IIT Madras provides opportunities for people to endow Chairs with an initial corpus. The Institute Chair is intended to reward senior IIT Madras Professors for exceptional performance. The selected faculty for this Chair will be identified as ‘Deepak Parekh Institute Chair’ for a period of five years, an appointment that can be renewed subsequently until retirement. 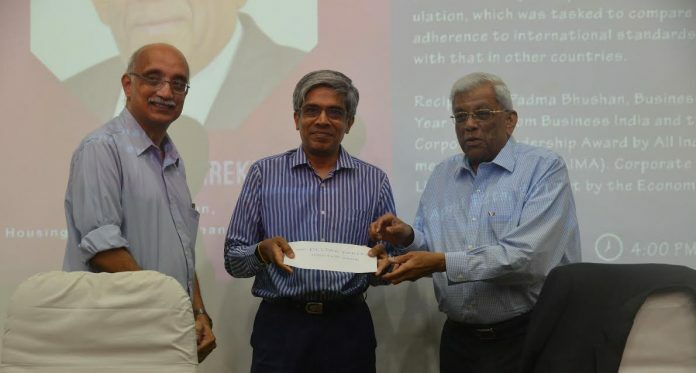 The Deepak Parekh Institute Chair has been endowed by an anonymous benefactor. So far, 15 professors have been named as Institute Chairs, and 11 of these have been sponsored by donors. The Chairs are named by IIT Madras in consultation with donor. The first occupant of Deepak Parekh Institute Chair will be Prof. T. Pradeep, Department of Chemistry, IIT Madras. While an estimated 1.5 million engineers were released into the job market annually, he pointed that four-fifths of them are considered unemployable, despite having over 3,300 approved engineering colleges in the country. “Education needs to be a dual balance of classroom instruction and practical or vocational training. Given our rapidly changing world, it is the teachers who first need ‘up skilling’ and training so they in turn can teach a curriculum that is relevant to the times,” he stated. The Chair is named after Mr. Deepak Parekh who apart from being the Chairman of Housing Development Finance Corporate (HDFC) was also appointed by the Reserve Bank of India as the Chairman of the Advisory Group for Securities Market Regulation, which was tasked to compare the level of adherence to international standards in India with that in other countries. He is a recipient of Padma Bhushan, Businessman of the Year 1996 from Business India and JRD Tata Corporate Leadership Award by All India Management Association (AIMA). He was awarded with Lifetime Achievement Award by The Economic Times. Under the stewardship of Mr Parekh, HDFC Group took stake in CAMS, India’s premier Mutual Fund service provider, and helped in institutionalizing the brand. The Department of Chemistry at IIT Madras is very active in research and in development of good human resources, with 35 faculty and 270 Ph.D. scholars and 108 M.Sc. students on its ranks, said Prof. Aidhen. While people in several parts of the country had benefitted, he said that “much much more work is needed to take the benefits of nanoscale materials to other aspects of water and environment in general.” He also thanked the donor and Mr. Deepak Parekh, and said that he was pleased to be associated with this Chair.